Michael Bostwick could make his 200th appearance for Posh against Bolton. Manager Grant McCann insists Peterborough United are in great shape heading into their toughest spell of the League One season. 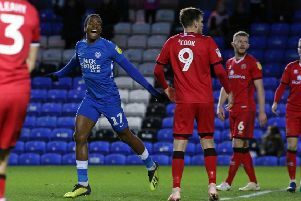 Posh have won their last three competitive matches after beating Chesham in the FA Cup last weekend and Barnet in the Checkatrade Trophy on Tuesday (November 8). Posh boss Grant McCann is in a confident mood. Posh also won their last League One game at Bristol Rovers so confidence is high ahead of a home match with second-placed Bolton on Sunday (November 13, 12.15pm kick off). Posh follow that game with a trip to local rivals Northampton, who are sixth in League One, on November 19 and a clash with current leaders Scunthorpe at the ABAX Stadium on November 22. “It’s a great time to hit some decent form,” McCann said. “We have some great games coming up against three teams in the top six, but we now have momentum and confidence on our side. “We have players coming back from injury and players coming into form. “I made a lot of changes for the Barnet game and some of the players who came into the side delivered their best performances for the club. If selected, Posh star Michael Bostwick will make his 200th appearance for the club against Bolton. Midfielder Gwion Edwards could be recalled to the starting line-up for the game against one of the promotion favourites.